This dish was first brought to Thanksgiving dinner in 2007 by my husband's grandfather. 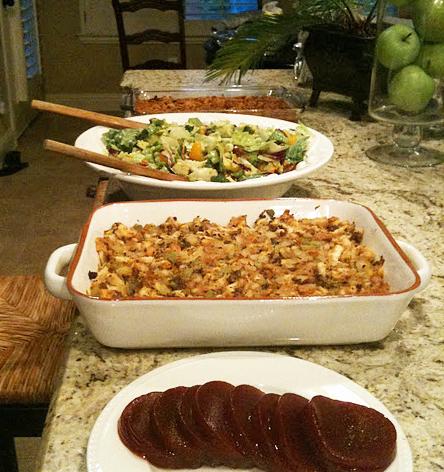 It immediately became part of our family tradition and one of my favorite Thanksgiving dishes. It is like a combination of cornbread and stuffing, but loaded with cheese, bacon, and french fried onions. Preheat the oven to 350 degrees and grease a 9x12 pan with butter. In a large bowl, combine the cornmeal with baking powder, baking soda, and salt. Add milk, melted butter and slightly beaten eggs the the dry ingredients and mix well. Once combined, add creamed corn and mix. Spread the cheese and bacon on the top and then, with a fork, push the cheese and bacon just under the surface of the batter. Sprinkle the french fried onions over the top. Bake for about 1 hour until a toothpick inserted comes out clean. That sounds disgustingly delicious! I want some! Thanks for sharing this! now this is something I definitely need to try. Sounds absolutely fabulous! I am your newest follower. yum, and what kind of salad is that?? yum, and what kind of salad is that? This sounds amazing! Can't wait to give it a try! Kim, you won't be sorry! It is YUMMY! !